Click on "TurboFit for software features and specifications. The main advantage of the Mini-CPX is proportional sampling: Only a small portion of the breath is sampled at the mouth using a 2.5mm OD tube. This eliminates the brathing valve and large tube to the mixing chamber, thus providing more freedom of movement of a test subject on a treadmill. 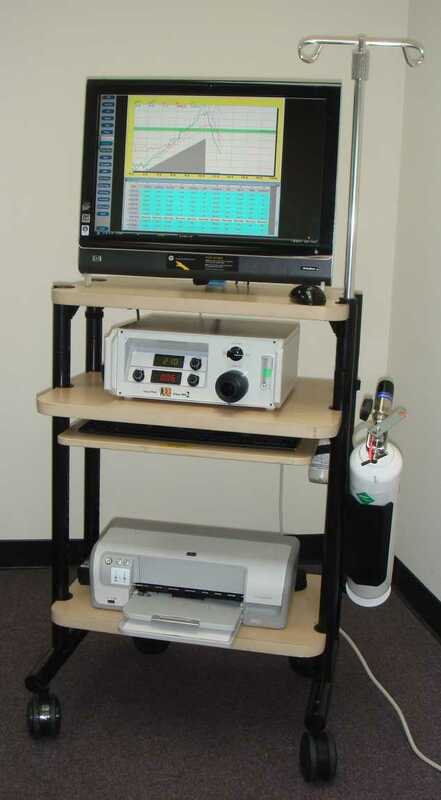 Vista Mini-CPX is a modular system for Cardio-Pulmonary Exercise Stress (VO2 and VCO2) testing. It may be used as a portable desktop system with your own computer as shown top right, or, with your choice of integrated mobile carts, including IBM-compatible computer and Super-VGA high resolution monitor, as shown top left. The basic Mini-CPX includes O2 and CO2 gas analyzers, turbine ventilation meter, a USB PC interface with our "TurboFit" software, automatic barometric pressure and temperature sensors and small, medium and large exercise masks. The gas analyzer specifications are identical to model 17620 and 17630. Flow Sensor: Bi-directional, micro-computer compensated turbine. Accuracy: +/- 2%. Click here to see more CPX options. Ask for a sample quotation with all options.